A True Farm to Table Experience at the Farm Byron Bay — Sapphire & Elm Travel Co.
At Sapphire & Elm Travel, we do our best to live a healthy lifestyle and try seek out the best quality food and drinks whenever possible. To be honest, a lot of our trip planning is centered around where to eat and drink and find fresh dishes indicative of the region. Who else likes to eat their way through a country? We've done food and wine pairings in Hvar, Croatia and eaten bottomless tomato soup in a greenhouse in Iceland. On a recent trip to Australia, we went to another epic food-centric destination. The Farm Byron Bay is a working farm in the heart of Byron Bay, Australia (just a two hour drive south from Brisbane). The town of Byron Bay, has long been a haven for environmentally minded individuals, and The Farm elevates that to the next level. The Farm was founded in 2013 by Tom and Emma Lane after they saw how much joy their backyard garden brought their 3 year old and they thought they could recreate that magic for the community. And that's exactly what the did. The farm sits on 80 plus acres on what used to be a dairy farm. The land was slated for housing but the Lane's purchased the plot and The Farm was born. Just a few years later, the farm is not only a working farm but a collection of micro-businesses that bring sustainably grown food the the community. After following their journey on Instagram, I knew I had to visit The Farm myself while I was in Byron Bay. With tours, classes and amazing food it's easy to spend an entire day at The Farm. As it is a working farm, don't be surprised to see a chicken or two roaming freely around the grounds. The Farm is located on Ewingsdale Rd, on the edge of Byron Bay in eastern Australia. From the road, it may not look like much but once you are on the property you are in for a real treat. It's a beautiful space and it's not everyday that you get to see where your food actually comes from. At the entrance to the The Farm lies Three Blue Ducks, a restaurant and full bar serving up farm to table food for breakfast lunch and dinner. They aim to source everything directly from the Farm or from local producers. You can tell in the quality of the food that they care about the final product they put on the plate. We went to Three Blue Ducks for breakfast before we explored the farm. The tables are all outdoors and over look the farm. It's a serene setting for any meal. If you don't have the time to sit down, you can pre-order hampers (picinic basket) to take into the farm to set up a picnic. Hampers serve 2-4 people and include meats, cheeses breads among other picnic staples. You can also grab bread and pastries from The Bread Social and take away coffee. Across from the Three Blue Ducks is Flowers at The Farm. The rustic nursery and florist sells fresh flowers and the cutest gifts like vases and candles. The fresh flowers are to die for. 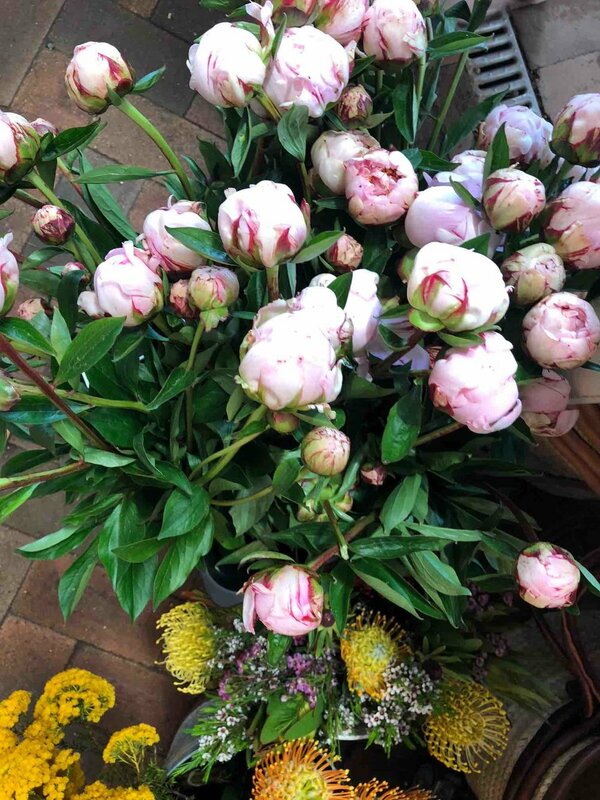 If I was local I would have stocked up on their peonies! The Farm is home to three types of livestock. While you stroll around the farm, you can expect to see poultry, pigs and cattle. The animals are given wide spaces to roam around and fed high quality diets. The animals serve the restaurant and community under a true 'farm to table' model. Located towards the end of the main road at The Farm Byron Bay is the orchards. At first I though the orchard was full of apple trees but it was actually macadamia and pecan trees. Macadamias evolved on the north-east coast of Australia 60 million years ago and thrive in the climate in Northern New South Wales. The macadamia trees in this orchard were planted in 1975. Also within the orchards is the bench of gratitude where you can sit an reflect on all that you are grateful for. With the hustle and bustle of everyday life its easy to forget to take a moment and reflect and the orchard is the perfect place to do just that. Just when you think you have finished exploring all that the farm has to offer and you turn the corner to head back to the entrance, you will stumble upon The Farms gardens. Here you will find all the produce that the farm is growing for the restaurant and the community. The Farm uses organic growing practices to bring the best quality produce while working to minimize any negative impact on the environment. For instance, crops are rotated in the field rather than planted in the same plot year over year and crops such as clover are used to add nutrients to the soil and to prevent weeds. This keeps their produce free of toxic chemicals and pesticides. Possibly the coolest thing about The Farm is their efforts to give back to the community. Active projects include a partnership with Liberation Larder, an initiative that supply's roughly 550 meals a week to the community. The Farm donated a quarter of an acre plot to supply vegetables to Liberation Larder's meal program. This is just one of the ways The Farm strives to help the community. Check out Projects at The Farm Byron Bay. The Farm is the perfect spot to spend the day. Want to visit the Farm for yourself? Contact us to start planning your trip to Byron Bay.